We were all rooting for you, ZiGi!! 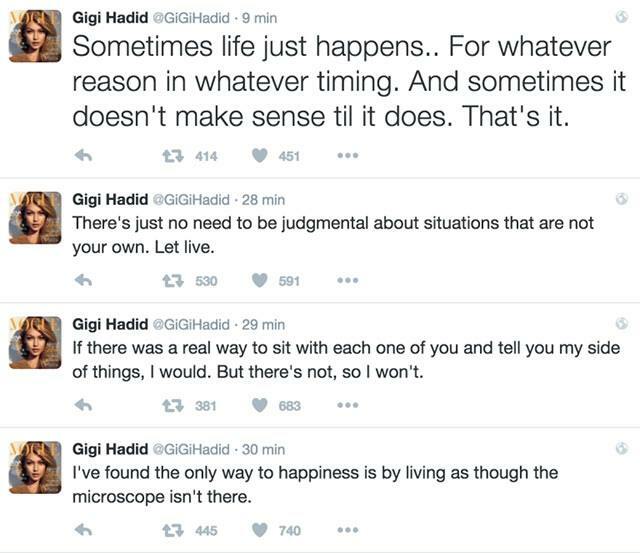 Gigi Hadid and Zayn Malik have mutually confirmed their breakup with a pair of Twitter statements. It's perhaps the last thing they'll do mutually, womp womp. Zayn broke the news first with a message memorializing their "incredibly meaningful" relationship, and paying tribute to Gigi's "incredible soul." Gigi offered a statement of her own, writing that she's "forever grateful for the love, time, and life lessons that Z and I shared." She did not highlight her cameo in Zayn's "Pillow Talk" music video, which seems like a diss to me! I loved that track. Gigi and Zayn had been dating for two and a half years, after reportedly meeting at a Victoria's Secret Fashion Show after-party. They split in June 2016, E! News reported, but only for a hot minute! (Emphasis on hot, because, you know, they're both beautiful.) While the pair hadn't been photographed together since January, Zayn just debuted some new body art which featured Voldemort, wait no featuring what many took to be Gigi's smoky eyes. Also though, yes Zayn really does have a tattoo of the Dark Lord. P.S. We'll always have the memories of their lovely coupled-up Vogue cover!!! !